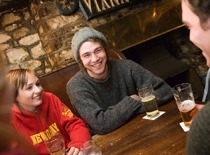 Unwind in one of the Vale’s numerous country pubs, historic inns, chic bars and award-winning restaurants. Whether you prefer fine dining, relaxed bar food or beer gardens, there’s plenty of choice when it comes to eating and drinking out. If that wasn’t enough, the Vale has an abundance of attractions. Whether it’s exploring medieval castles and towns, relaxing on one of the many sandy beaches, or enjoying the Vale’s unspoilt countryside, you’ll find plenty to do during your stay. Just minutes from the M4 and Cardiff International Airport, the Vale of Glamorgan really is very easy to reach, however you choose to travel. Play the game, explore, revive or relax with a Vale Golf Break. Alfan Huw Dafydd, Actor in the Explore and More Heritage films, part of the new Vale of Glamorgan Heritage Experience. 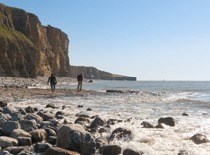 We have a perfect location in South Wales. Just a short drive from the M4 and Cardiff International Airport, the Vale is very easy to reach. The Vale has a wealth of places to eat and drink, from rustic inns to award winning restaurants. Whatever your flavour you’ll find plenty to choose from. Whether you’re looking for adventure or relaxation, the Vale has plentiful activities and attractions to explore come rain or shine.